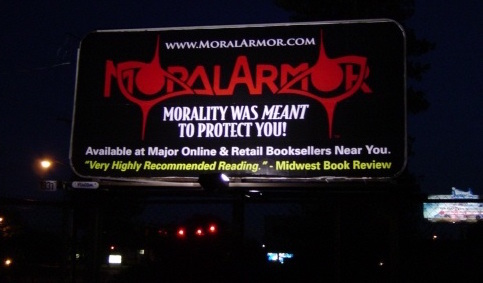 Moral Armor will be read in a way that makes the videos easy to navigate by subject, so some will be longer, some shorter, whatever makes sense as I go. The book has a mix of philosophy, psychology, and picturesque projections as examples, which are natural to a reader, but seem a little odd in spoken form. No big deal, but I’ll do my best to make it flow. As I get more comfortable, there will be more commentary in the videos in addition to the text itself. Here is the first installment. Enjoy! There is no need to be afraid. This image of dark vengeance is startling, I know. Pursuers tend to assume traits of the pursued. In a battle against open evil, this is the form which the good must take. You have seen me before, in the desperate need for a guardian—one who should have been there. I watched the betrayal you felt when no one came to rescue your innocence. I saw your tortured, valiant effort to understand what they had made of this world and why; so I left to discover the answer. I will not bring you harm. This hostile, vibrant force is protective; look closely: yes, that’s right; strength, certainty and amusement; a portal to the world you expected this one to be. What did you think would be on the other side? I have returned, to pull you out and take you there. We are to be the victims of the soulless, no longer. Battered? Bruised? I know. But I’m back now, and it’s going to be alright. Where was I? It began as a wonderful dream. We met, exhilarated, living eyes full of hope, of love, of fantasies for our future. Intoxicated by the mystery of each other, so pure, so faithful, so devoted. All lies. The site of a plane crash; the decimation of my heart; shattered… blackened… transformed. Now I lay quietly, undetected, viewing the evil without a spiritual pulse of my own; detached, incorruptible, intransigent. No more values to seek or to lose; the perfect camouflage. The time for fear has passed. I look with steady, all-seeing eyes, upon that which has torn away my most precious possession. I vow to hold down my pain and last long enough to warn the others—my dying wish: to see those who still have a chance, lifted safely out of their reach. Every day without her—my life’s pinnacle, worked for, bled for, reached and discarded as an unspeakable fraud, is another day spent in front of a firing squad. The same feelings day after day; the stillness, the grim finality I chose, is better than the long, drawn out murder I was to suffer at her hands. Resurrection? One day; but I can’t think of that now. With death, there is peace. Peace enough to do what I have to do. It was the last straw in a lifetime of unjustifiable inflictions; the last sanctioned violation. I’d had enough. The plague must be eradicated once and for all, no matter the cost. She drained me; not taking my life, but taking my will to live. Which is worse? Years of philosophical study could not shield me from what happened. Was it supposed to?…I don’t know. But now, I have grown strong enough to shield what I sanction, and to blast the whole structure of evil, back into the dark ages. Then maybe, I can return to what I once was; maybe. Sometimes, when the fire of your will has gone out and your passion has been consumed, just knowing what killed you is enough. Our Plague. Through every hurtful deception of others, every limitation, every act of cowardice, every evasive reaction, a voice inside you has said, “Don’t turn away! Look at the treason; remember it.” You knew these evils were all connected somehow; that there was a principle outside of your range, left to future discovery. The time has come. We met for the first time, through the courage of that voice. Justice is what stepped through the shadows of the background, and now it has taken form. I have identified what no one has had the stomach for, and have returned with the defense from all the pain and hardships imposed on us that we never should’ve had to endure. Now there is a path cut to leave the anguish behind; a road to higher ground, but first we must return to the origin of the conflict and create a bridge to this new world. For centuries, the world has suffered from a glaring yet elusive plague, which has kept men cowering in uncertainty, gun-shy in contemplation of every moral step. It has kept men from gaining their rightful pride and spiritual freedom, and from living their lives to the fullest. It has kept parents from handing down the most valuable traits they could give to their children, allowing their lives to flow smoothly and their relationships to be sound in turn. It has kept men from validating their own judgment, and left them open to any atrocity. It is responsible for erecting a wall of stress between their productivity and the enjoyment which that effort deserves. It is responsible for all of the heartache suffered by mankind, and has led to every disloyalty at the hands of its devotees. It has been a plague of moral confusion. There has been a very specific victim all along, within you and outside of you; and a very specific predator, within you and outside of you. The worst premises have been feeding their fear by riding and torturing the best through an inverted moral code, where the good is the evil and the evil is the good; a weapon most people have never conceived of or thought to question. Morality, the crucial life or death, brother against brother, walk on eggshells issue—has always been the ultimate taboo subject. Since my earliest capacity to identify good and bad, I’ve watched in pathetic amusement the senseless, contradictory actions of my elders. It seemed so straight forward to make judgments and act accordingly, that I couldn’t understand how moral issues could divide everyone into their hurt, indignant sides of foggy uncertainty and stubborn evasion. I believed that reality was real. From my earliest encounter with others to present day, I have watched most act as if it wasn’t. Siblings sponged, connived and tortured as a means to deal with existence, and there was nothing they would not sacrifice to keep their illusions intact. We were taught that judging one’s character and beliefs was to be avoided at all costs. The grown-ups around me were all so tangled in lies, reproaches and cowardice that their range of thought was barely able to project into the next day, and twenty-five years later, they have come no further. Uncomfortable with my pursuit of knowledge and higher clarity on any subject, adults discouraged it with, “Who are you to know?” Curiosity about their self-destructive behavior was deflected with “Who are you to judge?” Their relationship advice was, “Don’t ever talk about anything meaningful” (and discover whether you are compatible). As my understanding grew, their malice towards me grew. I was engaged in the forbidden; I was looking. Unable to comprehend their motives, I lived in moral confusion, suffering at the hands of subhuman beings for my willingness to see, to think, to judge and to act. It was almost as if my guardians believed that honesty was profane and lying was virtuous; that weakness and incompetence deserved affection while strength and ability deserved contempt; that awareness was destructive and blindness was kind. As a child, I looked up and saw that everything was backwards! Their teachings seemed to say that whatever gave me exhilaration for living was somehow wrong; and yet how could I renounce my sight, my hearing, my mind and body, and continue to enjoy life? By what means and through what senses would I then seek fulfillment? If comprehension, if seeing the truth, if deeply breathing the cool, fresh air into my proud, strong, able young body, boundlessly pursuing all the wonderful discoveries of existence, was evil, then why should men wish to live at all? I never doubted myself; I thought they were idiots. They made all of life an unrewarding hell, until I discovered just what drove them. If moral judgment was to be interpreted and applied by men, then they interpreted it wrong, like every other primitive and dysfunctional aspect of their lives. The fault did not originate with their Bible per say; they simply tailored their moral view to cover their own fraud, while the productive were quiet on the subject. Before learning deception as children, all of us could see the source of hostility, of cowardice or of phoniness. If it began and ended in one individual, we knew it. Innocence is not stupidity. Lack of experience is not incompetence. We knew when we were hearing lies. We always did. It was their folly and its miserable result that I chose to renounce. I held my potency in reserve, longing for the day when the power to determine my course would match the power I felt while observing my world. I’ve always had a special relationship with existence; a feeling that others didn’t share. I was at home on Earth, glad to be alive, where the emotional response of others was to cope. The elements of nature were there to serve me; to be commanded by my direction, while others reacted as if some unknown beast was about to devour them. I would watch the same mistakes of my elders being made by the fear-ridden of my generation, and laugh; I’m not sure just when I began to consider it dangerous. With life experience and budding philosophical clarity, my contemptuous humor towards such self-abasing cowardice descended into a long, dark period of indignation, and then a fear of my own. The insanity was extrapolated deeply into business and world affairs; it marred everything in its path. I couldn’t escape its influence and still couldn’t believe that anyone took it seriously. Operating so clean and efficient, I was eager to share my glorious road of achievement with others and longed for our worlds to merge. But in relationships as well as in business, I kept suffering that code’s painful betrayals. Instead of the elegant atmosphere I expected, business was like an even more profane and immature high school. My most profitable ideas and efforts were scoffed at, and then stolen. Competence took a back seat to age, seniority or cliques. With friends and lovers, I was abandoned for being too successful, or I was used. They would not expand their concern outside of the inconsequential, and they ignored everything I needed acknowledgment for. Explaining to family a facet of industry unseen by my competitors, the response I would hear was, “But are you eating enough?” There was a whole level of my life I needed to share, and no one to listen. No one to understand. I felt like a freak because I was unable to erase this feeling: the feeling that life is a quest; a quest of the most crucial importance, allowing no primary time or consideration for the details. But my reward in any attempt to convey this was always a blank stare, and then something like, “Have you called your grandmother?” I could not bring my mind back to that level. I could not reverse the priorities of my consciousness, and it took years to conceive of our fundamental incompatibility. I would meet a woman and have a similar emotional response to what I felt about my work; that our relationship was something epic, to be knelt before and carried out with reverence; a shrine of magnificence for us to build. I could see the beauty of our bodies and the beauty of the world together. I could feel the awesome power of life as almost audible, but it would be sunk with her complete reversal of claimed intentions. Fear drove everyone to wear masks; no one was what they portrayed. It began to ruin my enjoyment of life; time was being lost and it just wasn’t funny anymore. I saw irrationality in every direction; my head wanted to explode, and I could sense that it was all tied together somehow. I refused to give up. As my wealth and ability grew, so did my distance to others; not by my choice, but by theirs. I could not understand their discontent, and little by little, I lost everyone. Heartbroken, I couldn’t see what I was doing wrong. I worked so hard; much harder than they did. Wasn’t I good enough? It was incomprehensible to me that they could be responding with hatred toward the things I did well, but they were. Entranced with my style of living yet locked in social dysfunction, I stepped out. I stayed the intellectual course, trying to understand. I was sure that when I did, I would discover or create a world to match my ideals; my true homeland. I had glimpsed that world from time to time, as my means of its attainment grew more consistent. I could see it coming. Yet so ingrained was my tolerance of evil, that I had to be taken down in one final conflict before I accepted the truth. When I resurfaced, I found as in a rite of passage, that a shimmering, glistening, living morality awaited me. I finally stepped out of their reach. The rewards were clear and forever mine, but the evil was still there, and the war had just begun.